Slice the beef into thin strips. Add half of the soy sauce and juice from half a lime to a bowl. Add beef, tossing to coat, and set aside to marinate. In a liquid measuring cup whisk together the beef stock, cane sugar, remaining soy sauce, cornstarch, and remaining lime juice. Set aside. Peel the garlic cloves and ginger and finely chop. Thinly slice the green onions and chili. Transfer to a bowl and set aside. 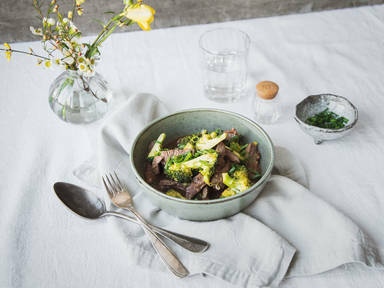 Cut or pull apart the broccoli into small florets. Pre-heat wok and heat some sunflower oil in it. Sauté the beef for approx. 2 - 3 min. Remove the meat from the pan and set aside, working in batches if needed. Fry the garlic, ginger, green onion, and chili with more oil. Add the broccoli florets and sauté for approx. 3 – 5 min. Return the meat to the wok and add the sauce. Mix well and cook until the sauce is thickened, approx. 5 min. Enjoy!